Raise $100.00 to get your Relay tshirt. But don't stop there! Receive recognition prizes for your total individual fundraising efforts from $250 all the way to $10,000+! All money must be received by the deadline established by the event (bank day or onsite). Learn more about the 2014 Fundraising Club and how you can be recognized for your tremendous fundraising efforts. 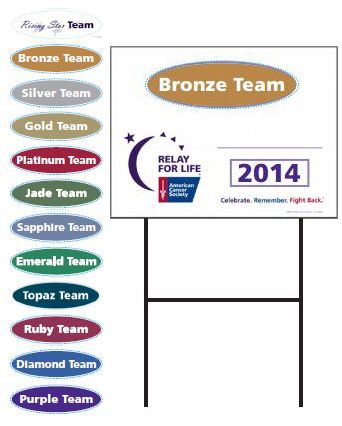 Show off your team's wonderful fundraising efforts with a Club Sign. 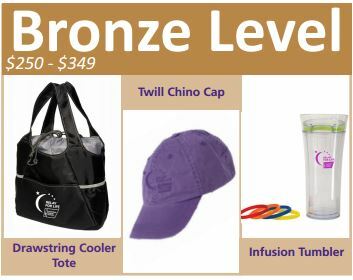 You will be presented a Club Sign when you reach each Fundraising Club Level. Each time you reach another level, your staff partner or event chair will update your sign with a new sticker. Carry your sign to Team Captain Meetings and post it at your event campsite to proudly show your collaborative team success! Get more information by downloading the Fundraising Club flyer. Got any favorites? Share them in the fundraising forum!